Most things that give enjoyment are not bad. In fact, most things in life that we enjoy are entirely without sin, even if they do induce sensual pleasure, such as, let us say, chocolate, that most wonderful of confections. My review contains information about the story, so if you haven’t seen the movie, beware. Reading this review may spoil the ending for you! It is 1959, in a French village surrounded by a wall and a river, barricaded from the world as if it hadn’t changed since the Renaissance. On a Sunday morning when everyone is at church, a woman, Vianne (Juliette Binoche), and her young daughter Anouk (Victoire Thivisol), trudge through the wind and snow to open a chocolaterie. Vianne is destined to wander from town to town, as her mother did, dispensing the joy of chocolate. She carries her mother’s ashes with her and she knows that Anouk will also be destined for the same fate. The mayor, Comte Paul de Reynaud (Alfred Molina) finds it sinful to open such a business during Lent and he encourages the villagers to boycott it and their young priest, Pere Henri (Hugh O’Conor) to preach sermons against it. When he discovers that Anouk is an illegitimate child and that Vianne will not attend mass, he becomes even more consumed with driving her out of business. He has his own problems: his wife has gone to Italy and it looks like she isn’t coming back and he is also struggling with his own desires for food as he starves himself in his sorrow. In order to coax the villagers to buy her chocolate, Vianne gives away free samples, winning over Guillaume Blerot (John Wood), an older man whose little dog Charlie likes the treats. Blerot pines after a WWI widow, Madame Audel (Leslie Caron) and he wins her over with little chocolate treats. Vianne’s first real friend comes in the form of her landlady, Armande (Judi Dench), who also doesn’t go to church. She is estranged from her daughter, Caroline (Carrie-Anne Moss), who works for the Comte and keeps her son, Luc (Aurélien Parent-Koenig), away from his grandmother. Vianne arranged for Luc to spend some time with Armande at the chocolaterie under the pretense of his drawing a portrait of her. Vianne wins another friend when the owner of the café, Serge (Peter Stormare) beats his wife Josephine (Lena Olin) who runs to the chocolaterie for sanctuary. She stays and becomes Vianne’s assistant. The Comte attempts to force Serge to get himself together, making him abstain from alchohol, teaching him manners, sending him to catechism classes. The town is thrown into chaos when a band of gypsies arrives by boat, docking along the river front. Led by a charismatic young man, Roux (Johnny Depp), the gypsies want nothing more than to trade, but the Comte forbids it and mounts a campaign to have the villagers boycott the gypsies. Of course, Vianne is intrigued and makes friends with Roux. When Serge assaults the chocolaterie in a drunken rage, breaking open the door, the women fight him off and Josephine knocks him out with a skillet. Roux volunteers to repair Vianne’s door and she agrees to hire him, thus breaking the boycott. The Comte takes his fight with her to a new level as he tells all of the villagers that to consort with her is to consort with the devil and he makes Pere Henri do the same thing from the pulpit. Vianne feels that the whole world is against her and considers leaving, but Armande requests that she throw her a party for her 70th birthday. Vianne also has planned a Festival for Easter Sunday. Most of Vianne’s friends attend, including Luc and Roux, but dessert is to be served on Roux’s boat and they all retire there to dance and enjoy the evening. Caroline comes in search of Luc, but when she sees him dancing with his grandmother, she doesn’t interfere. However, Serge brings the Comte to see the party and the mayor tells him, “Something must be done.” When the party winds down, a fire erupts on the boats. Seeing the damage, Vianne decides that it is time to leave, so she packs, over Josephine’s pleas that she stay, and forces to Anouk to join her, but they fight and her mother’s ashes are spilled. There is laughter and she looks into her kitchen to find Josephine leading the villagers in the preparation for the Easter Festival. She abandons her plans to leave. On the night before Easter, Serge confesses to the Comte that he started the boat fire because the Comte had told him that “something must be done.” In a fit of rage, the Comte banishes Serge from the village, then goes to pray, confessing that he is so starved and so weak of spirit that he must do something. Taking up a knife, he breaks into the chocolaterie to destroy the confections in the window display, but a bit of chocolate splashes onto his lip and he licks it up. In one moment, he loses his composure and begins to eat every bit of chocolate he can get his hands on. The next morning, Pere Henri sees the mayor passed out in the window display, covered in chocolate. It’s hard to imagine anyone crusty enough not to love Chocolat. It is a wonderful movie, beautifully and movingly directed by Lasse Hallström, the Swedish director who also gave us The Cider House Rules (and, by the way, Lena Olin’s husband). The music by Rachel Portman, part gypsy, part Hispanic, part French, is absolutely perfect for every scene in the film. Adapted by screenwriter Robert Nelson Jacobs from the novel by Joanne Harris, the story is strong and true, moving, funny, and uplifting. All of the actors are wonderful and it would be hard to single out one performance that stands out above the other, but I must mention that Judi Dench is amazing as Armande and that Johnny Depp’s guitar adds a great deal to the fun. 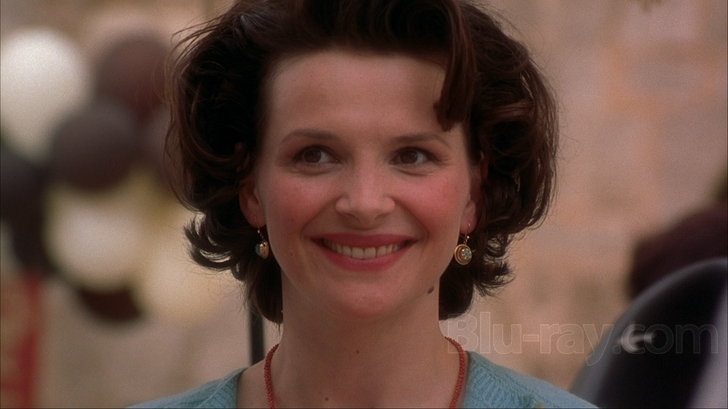 Binoche is lovely as Vianne and it is good to see her teamed with Lena Olin, the first time the two women have worked together since The Unbearable Lightness of Being. This is an incandescent story of freedom. No matter how firm oppression may seem, if you are good and true and give love back to the world, the world will eventually come to you.